He would cite parts of this quote within the context of a situation where I was being unnecessarily “strong” or perhaps proud. We can get caught up in notions of being “strong”, “having opinions”, or being “independent” all of which are well and good if appropriately placed. But, there is an equally important place for vulnerability. I remember what a revelation it was for me to consider that showing vulnerability could actually be a sign of strength…and I suppose that my difficulty being in that place is testament to the fact that strength is much of what it takes. There is a wonderful TED talk by Brene Brown that discusses the power of vulnerability. I’ve watched it several times, and each time I’m more inspired to go to that place where there is admittedly no control, no certainty, and no guarantees…but only character and closeness to gain. In fact, Brown argues that "vulnerability is our most accurate measure of courage." So as much as I dislike it, I'm working on embracing it. 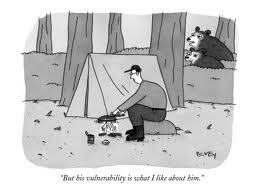 How do you perceive vulnerability?